When hearing aids are not effective, children with severe to profound hearing loss may choose cochlear implants to directly stimulate their hearing nerve. As they enter school, what accommodations can their classroom teacher provide to create the best learning experience? If a child is not aware that the teacher has begun to speak, they will miss out on important classroom instruction. All children in the classroom can benefit from a teacher alerting them that it is time to pay close attention. Sounds can bounce around a room or compete with the teacher’s voice. Examples include a classroom’s air duct system, other children talking, and outside noise. Sitting a child closer to the front of the room while away from doors, windows or other background noises can reduce a student’s effort to hear their teacher. For older students, this could take the form of providing written instructions for a task as well as presenting the word verbally. For younger children, a visual chart of images is a great supplement. Think of an art task to create a house, where the teacher has a visual aid with each piece of the house glued on a page separately, and then what the final goal should look like. Just because a child seems to understand, does not mean that they do. Checking in with a student to see if they need a repetition, or asking them to repeat it back in their own words, can avoid frustration of having to redo an assignment or wasting time. Think of the last time someone new told you their name which contained different sounds than those of your native language. It can take several exposures to a new word before a child can recognize it the next time. Learning the speech sounds as well as meaning of new vocabulary words will support a child’s ability to identify them when they are used in the classroom context. 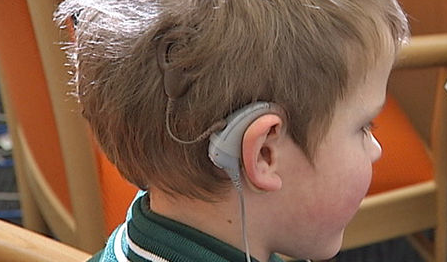 A cochlear implant is a piece of technology that students use of a daily basis. Depending on their age, a child can monitor whether a battery needs to be replaced or a piece of equipment breaks down and asks a teacher for help. And as a new school year begins, explaining their needs to their new teacher can be critical to overcoming the hearing challenges of the classroom as a team.